Just as there are a lot of different Aboriginal language groups in this town, there are also, within the Arrernte world, a lot of different experiences of language. 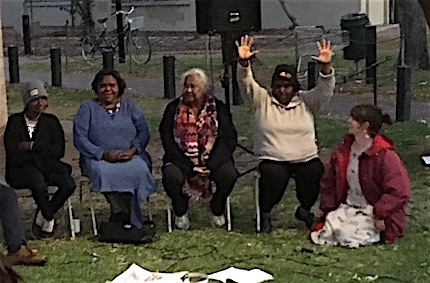 These stories emerged strongly from last night’s forum on language, opening NAIDOC week. Left: panel members from left Doreen McCormack, Pamela Lynch, Felicity Hayes, Veronica Lynch, Joel Liddle. A large panel of Arrernte people assembled behind the Flynn Church, across the way from the “yellow house”, which for the last two and a bit weeks has been operating as Apmere angkentye-kenhe (A place for language). The gathering heard from elders who have retained and fought for their language and, movingly, from people who have lost it. Harold Furber, who was taken from his Arrernte mother as a small child, asked for respect not only for language but for the loss of language. He said he was tired of being told that if you don’t understand your language, you’ve got no culture. Sisters Veronica and Pamela Lynch grew up at a time when their parents were told not to speak to them in Arrernte. They were sent to school and were taught in English only. But now through Batchelor Institute they are reclaiming their language and hope to be able to engage their children with it on their homeland at Black Tank. Joel Liddle grew up in Canberra and Melbourne, with his Arrernte father and non-Aboriginal mother. His grandmother, Emily Perkins, was a fluent Arrernte speaker, so he was well aware of his Arrernte language heritage from family visits back to The Centre. His father didn’t have full knowledge of Arrernte but was on top of the pronunciation so with the help of the Henderson and Dobson dictionary (of Eastern and Central Arrernte) Joel would try to learn some words with him. Eventually he came back to The Centre, intending to use his Western education for the benefit of his community. He realised he could only do that effectively if he had Arrernte language so he got cracking on learning. He acknowledged the elders who have supported him, mentioning his aunty Kathleen Wallace, Veronica Dobson, as well as Shaun Angeles. Right: panel members Kathleen Wallace, Margaret Kemarre Turner OAM, Peter Wallace. Beth Sometimes, from Watch This Space, who facilitated the panel, asked what people would like to see happen to support language learning if money was no object. Mr Liddle thought the multi-lingual programs in Europe, where children learn three to four languages at school, had much to offer the largely monolingual Australia. He also spoke of the Welsh Language Society and the work they have done around Wales in dual place-naming, for example. He didn’t see why the same couldn’t be done in Australia. He referred to the expectation in the past that non-Aboriginal people providing professional services on Aboriginal communities would learn the local language and argued that this should be reinstated. Sylvia Neale was highly critical of the failure of Northern Territory and Australian governments to properly support Arrernte in schools. They support other languages such as Chinese but “as usual pass us by”. She, like other speakers, emphasised the importance of Aboriginal people learning to read and write their languages. Mr Liddle’s experience of consulting the Arrernte dictionary as a child is one example of the usefulness of this. He argued for acceptance of the orthography now used as a consistent system developed over decades that writes the language as it is spoken. Veronica Lynch wants all schools in Alice Springs to teach Arrernte, starting in the early years, Transition or Year One. Left: panel members from left Veronica Turner, Shirely Turner, Sylvia Neale, Amelia Turner and facilitator Beth Sometimes. Felicity Hayes said bilingual education is “a must” and spoke of her experience as a teacher working in the Irrkerlantye unit at Bradshaw School, where Arrernte was taught for 45 minutes a day. Kids weren’t learning or not well enough, which left her feeling “really sad”. She contrasted the classroom-based approach with the experience at Children’s Ground, where they take children out bush to learn “our way”. Veronica Turner, who also teaches at Children’s Ground (which operates across three sites), spoke of the benefits of taking the little ones out to their homelands because “we are from the land, the land is us”. It is part of learning to live “as Aboriginal Australians” and being “proud of who we are”, said Mrs Hayes. That goes too for children of mixed descent. Peter Wallace spoke of talking “both ways” to his little “yella fella” and taking him out bush to learn about “our land” – “we know where to start”. 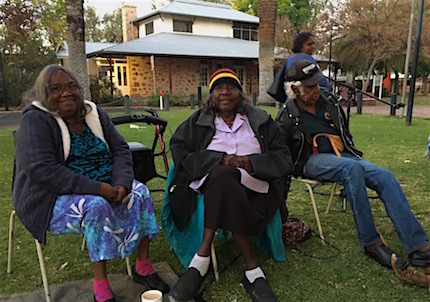 Doreen McCormack spoke with some delight about her grandchildren who “look white” but are fluent speakers of Luritja and Arrernte. Akeyulerre Inc also runs a language program for children during the school holidays, said Amelia Turner, although it’s not a holiday for the kids who are kept busy learning about their country. A number of people spoke of their frustration and offence at being all “lumped together”, as Mrs Neale put it – of being approached as if they were one Aboriginal people rather than distinct peoples with their own languages. How should other people find out which language group someone belongs to, Ms Sometimes wanted to know. 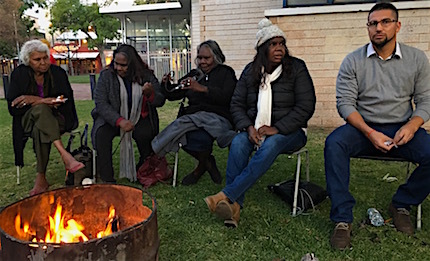 Just ask where people are from, said Margaret Kemarre Turner OAM, who, like Lorrayne Gorey, objected to being called “kungka” when she is “arehle”, and having her children and grandchildren referred to as “tjitji” when they are “ampe”. “These people at the hospital need help,” she said – training in who’s who and what languages people speak. Of the “yellow house”, Mrs Turner said “we’d really like to make it into Alice Springs. 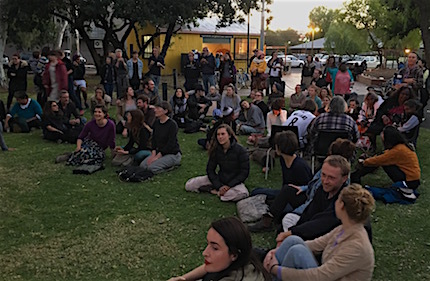 The people of Alice Springs need this place” – young and old alike. She urged learners to go beyond the 50 word challenge, to start using Arrernte in sentences, to be able to ask questions like “where do you come from?” in Arrernte, to learn the Arrernte place names. In particular, she said the mothers of children born in Alice Springs should encourage their children to learn “so they have respect”. The remaining sessions open to the general public at Apmere angkentye-kenhe are on Wednesday from 10am, with the 50 word challenge running from 12.30 to 1.30pm, then open again from 4pm to 6pm. On Thursday there will be Arrernte story-telling for kids and families. Arrernte was taught for a term at the new Braitling Preschool this year and the children from a huge range of cultural backgrounds loved learning the language with Margie Smith. She was a good teacher however she is in high demand and required to teach it at other schools and couldn’t continue. The children and parents were sad to no longer have it being taught. Funding should support this program for all children to learn some language and cultural knowledge who live in AS. My own children learnt it a bit at Anzac HS with Sabella Turner who too was a good teacher quite sometime ago now. Funding should also be allocated to two way learning in schools and have the ability for children to learn to read and write and become multi lingual in the system. If language truly matters then the system has to change. This has been said by many of those amazing ladies you spoke to for over 40 years and it’s still being said. No funding support from any Govt has really ever supported strong language and cultural teaching as well as strong English literacy teaching so all children can be taught their identity and diverse cultural knowledge that enables them to be literate people who can negotiate their world and truly be global citizens with equal power.